For me, The Land of Stories Book 1: The Wishing Spell, is reminiscent of one of my favourite novels from my childhood, The Farway Tree by Enid Blyton, though in a much more modern setting. The Land of Stories Book 1: The Wishing Spell sees twin tween characters Alex and Conner sucked into their Grandmother's old fairytale book, where they discover that a lot has happened in the lives of the many beloved fairytale characters since their "happily ever afters". Alex and Conner find themselves on an impossible and dangerous quest to activate the wishing spell, which is the only known way that they could get back home. 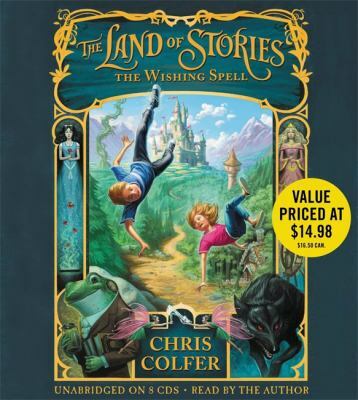 Author Chris Colfer (who is well known for his role as Kurt Hummel in Glee) narrates his book, drawing on his acting abilities to deliver an engaging and energetic reading. Though he sometimes reads a little too quickly, Colfer does have the ability to create quite distinct voices for each of his characters, allowing listeners to follow along easily as he draws them into his fairytale world. I did find that Colfer's writing is often clumsy and repetitive with action scenes that were sometimes confusing and inconsistent, both elements that are perhaps more emphasised in the audiobook format. However, the premise of the story is really well thought out and it captured my imagination enough to be able to overlook the writing and truly enjoy the re-imaginings of some of our best loved fairytales. I especially loved the twist at the end and will be continuing on with the rest of the series in audiobook format, with the hope that Colfer's writing prowess will develop as the story does. A full review of The Land of Stories Book 1: The Wishing Spell is available here.